Students participate in a Sources of Strength training session on Wednesday, September 19. 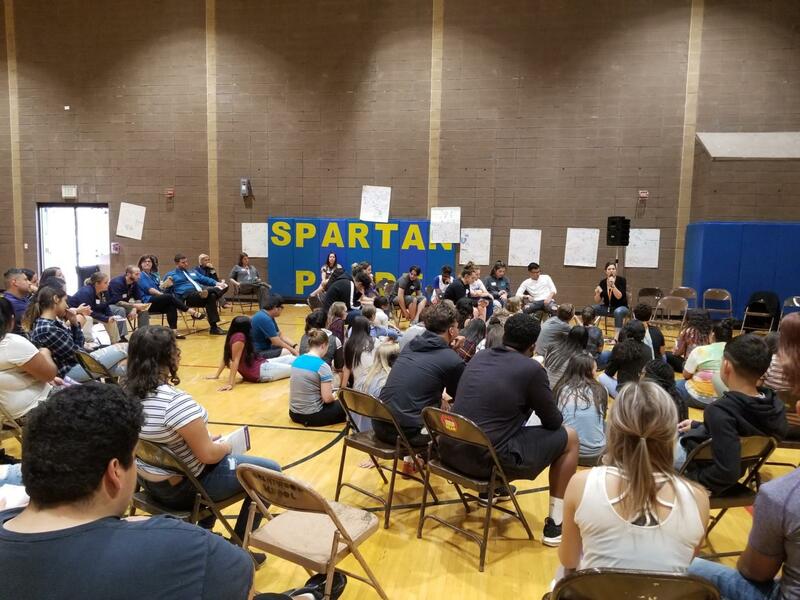 Last Wednesday, select Greeley West students were excused from class to learn about a new program that is starting called Sources of Strength. According to its website, Sources of Strength is a youth suicide prevention program that uses peer networking to combat daily pressures on teenagers. The organization works to promote positive factors in students’ lives. The program at West is being funded by a grant that assistant principal Ms. Amy Zulauf applied for and received at the end of last school year. The staff hopes to implement this resource throughout the year and continue to grow it in coming years. Before the student training, West staff members had their own smaller version of the training and talked about their sources of strength. This really helped bring new insight to the teachers. “It was awesome to discuss sources of strength with other teachers,” said counselor Ms. Kelly Stephens. During the program, students participated in ice breaking activities and broke down into groups and talked. A major focus of this meeting was to teach students how to support their peers in safe ways. This is important because the staff of Greeley West understands that students don’t always feel like they can speak to adults. The staff of Sources of Strength provided a model of eight different ways to deal with stress in a healthy way. This model included mental health, family connections, positive friends, healthy activities, medical access, mentors, spirituality, and generosity. Students and staff were very excited to talk about these and share stories with their peers. “It was nice to know I wasn’t alone,” said senior Josie Carpenter. The students and staff discussed various campaigns to unveil their message, including through audio, school wide events, video and social media efforts. Throughout the year, the program hopes to reach out and help more students through these various techniques. The counselors were very excited to see so many students wanting to be involved in the program but were sad they had to turn away some students due to a lack of space. They hope to narrow down the group of students to a small group that speaks on behalf of their fellow students. Through this group, they hope to figure out what campaigns to implement throughout the school year. The school still hopes to train more people and if enough students are interested, they will have another training second semester.